Canadian indie rock outlet Hey Rosetta! is at it again with their latest studio album, Second Sight. Thankfully, for fans of the band, it’s as tightly interwoven and eclectic as Seeds, but with sunnier instrumentation and a surprising showing of controlled turbulence. For those just jumping on the bandwagon with Hey Rosetta!, the band offers up a multifarious, cohesive mix of sounds. While Second Sight was released to the Canadian market on October 21 through Sonic Records, the band is just now offering the LP up for sale on American shores as of January 27. For those not in the know, Hey Rosetta! began in 2005 as the brainchild of St. John’s singer- songwriter Tim Baker. Realizing that he needed a more bombastic sound on some of the songs he had written during his travels throughout Canada and the United States, he brought on electric guitarist Adam Hogan, bassist Josh Ward, and drummer Dave Lane. It didn’t take long for them to decide on the addition of a cello and a violin to the band, effectively becoming one of the modern Canadian folk-rock pioneers, but with their own hefty, genre-bending twists. With Phil Maloney now on drums and the band featuring an illustrious seven members, their sound is more cutting edge than ever on Second Sight. Album opener “Soft Offering (For the Oft Suffering)” starts out on an appropriately “soft” ethereal string ensemble that, sooner than later, evolves into a fully-fledged rock orchestra. An unconventionally plucky guitar riff and tight percussion are met by a horn section and soaring electronic synth, all of which frontman Baker commands with an energy all his own. Similarly, follow-up track “Gold Teeth” opens up with an airy acoustic number before evolving into a low-key sonic landscape appropriate for smart lyrics representative of a modern threnody. The instrumentation actually devolves over the bridge, featuring not much more than a piano- inducted arpeggio laid under a consistent drumroll and amiable strings. Just when you think you’ve got it pinned down, though, the song instantaneously becomes incredibly boisterous in its last 50 seconds for a rock-out session first-time listeners would never see coming. Though the main focus of Hey Rosetta! is on bringing this tremendous band of instrumentalists together into one cohesive, expansive sound, a couple of the songs on Second Sight generously cater towards accentuating Baker as the intrinsic storyteller vocalist that he is. He delicately, but passionately, croons on the broodingly soulful “What Arrows,” accompanied by affectingly light instrumentation. After delivering a bombastic performance on the horn and string ridden “Harriet,” Baker delivers what just might be his most potent vocal yet on album closer “Trish’s Song.” The entire record comes full circle the moment that this track starts playing, in all of its tear-inducing glory. 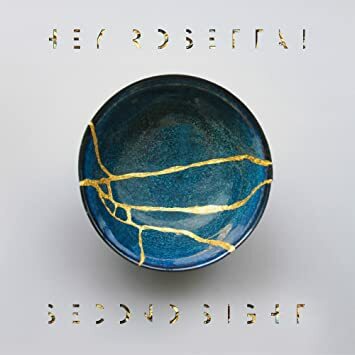 While not as anthem-ridden, and maybe not even as revolutionary as Seeds before it, Second Sight offers up yet another beautifully lyricized, lively exemplary experience from Hey Rosetta!, with enough variation in its sound to warrant it as the band’s new poster child without seeming stale. Second Sight will be released on January 27th via Sonic Records.